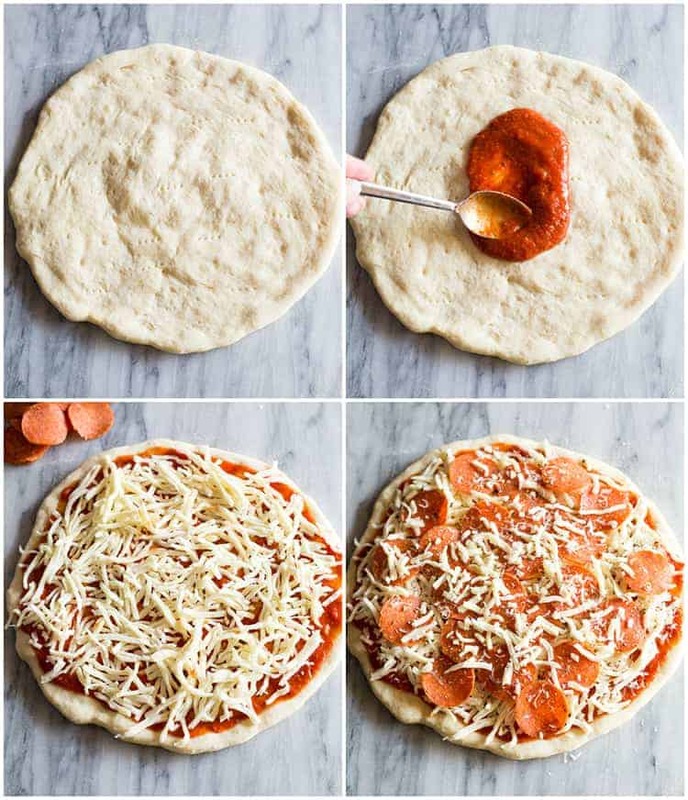 Easy homemade Pepperoni Pizza with homemade pizza dough and pizza sauce. Don’t let homemade pizza intimidate you because it is SO fast, EASY and delicious! I firmly believe that my homemade pizza dough will make you a pizza-for-dinner fanatic. 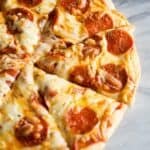 My family treasures homemade pizza; everything from this classic pepperoni pizza to BBQ Chicken Pizza, Loaded Jalapeno Popper Pizza, and Garlic-Ranch Chicken Pizza. We like to eat out one night a week, usually on the weekends. Last week we ordered a pizza and had it delivered. It cost about $20 total, and I ended up being a little mad at myself because making homemade pizza is so much cheaper, and I always have the ingredients I need. 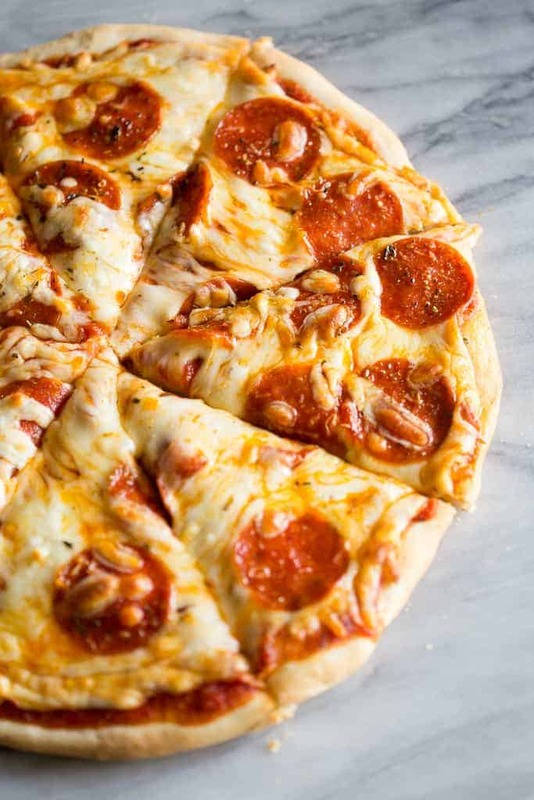 Not only is it cheap to make from home, but with my homemade pizza dough recipe, and the right toppings, it’s just as good as anything you’d buy at a restaurant! What do you need to make pepperoni pizza? You need pizza crust, pizza sauce, cheese, and pepperoni. Pepperoni is basically an American version of salami. Pepperoni is a meat mixture of beef and pork that has been cured and seasoned with paprika and chili powder. It’s a loved American food staple and most commonly used to make pepperoni pizza. Making pepperoni pizza is as easy as layering the ingredients on a pizza crust. Start with the sauce, then cheese, pepperoni, and a little more cheese. What toppings go with pepperoni pizza? 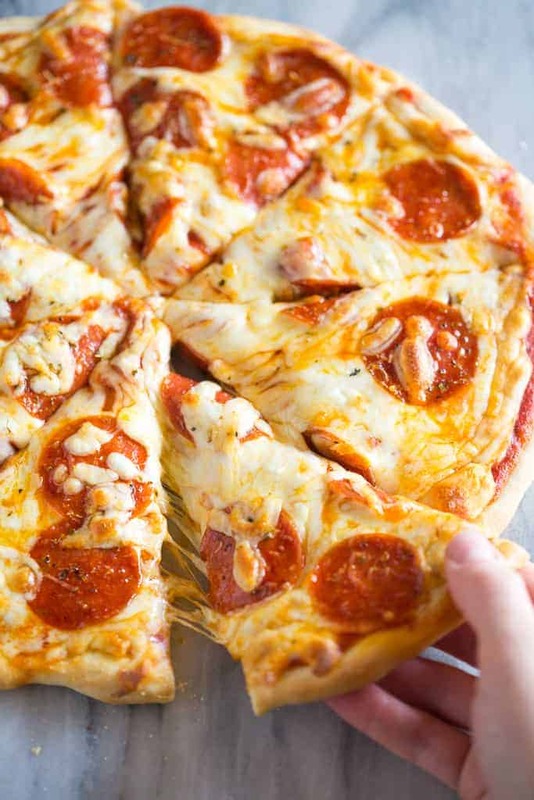 Traditional pepperoni pizza is made with pizza sauce, mozzarella cheese, and pepperoni. If you have made pizza dough before then you probably know that it’s super easy. My pizza dough recipe uses SEVEN simple pantry ingredients: (water, oil, sugar, yeast, salt, vinegar, and flour) and it’s every bit as good (or better than) your favorite restaurant pizza dough. I love how easy and inexpensive it is to make Homemade pizza dough. There are a few different options for making pizza dough ahead of time. Optional 1: Make the dough up until the first rise. Place the dough in an airtight container in the fridge to rise overnight, or for several hours, before rolling it out and pre-baking it. Option 3: Freeze the pizza dough. Form a ball with the dough and lightly spray it on all sides. Wrap it in plastic wrap and place it in a ziplock freezer bag in the freezer for up to 3 months. To thaw, place the pizza dough in the refrigerator overnight to thaw and rise. Then roll it out when you are ready to pre-bake. I usually slice my pepperoni pizza into 8 slices. Each slice is estimated to have 277 calories with 14 fat, 24g carbohydrate, and 13g of protein. I have used this recipe (and your pizza dough recipe) many times. We have loved making homemade pizzas with your recipes! Wonderful! Homemade pizza is such a fun thing to make with family.